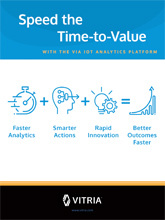 Vitria’s IoT Analytics Platform provides a fast path to insights and actions that empower customers to achieve better business outcomes faster. The changing landscape and dynamic IoT environment require new analytics methodologies, tools, and platforms to achieve better business outcomes faster. Operations managers can make significant improvements in their results by leveraging the proliferation of new data in IoT environments to predict problems early, generate new sources of revenue, and create improved customer experiences. Better Outcomes Faster using the self-service and automation capabilities and the dashboards with executive level summary views. Download the whitepaper now to discover how you can quickly achieve real business results using advanced analytics designed for the IoT era.